Smart Money People aims to bring to life some of the consumer insight that our reviews provide us with. 1) FinTech...lot's of buzz...but is it impacting customer satisfaction? 2) Current Account switching...are switchers happier? With 2015 fast coming to a close, the below consumer insight summary table highlights how consumers currently perceive their various financial services providers. The buzz around FinTech has reached new heights in 2015, and rightly so. With the UK’s first mobile-focused bank set to take prime position in the app store, it’s encouraging to see a diverse set of innovative business models leading the way. 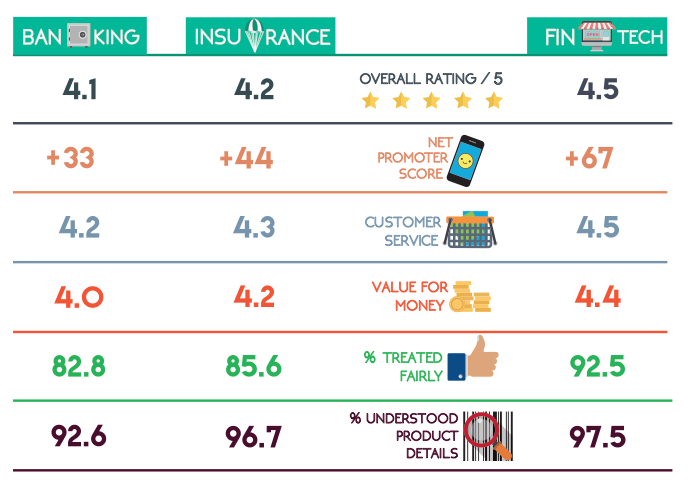 It's rather interesting to see that consumers are telling us that they have higher satisfaction levels with FinTech firms when compared to banking and insurance firms. That said, it is fair to say that the bar is still low. We’ve found that in practice, a 4* overall rating (80%) means that a financial organisation is ‘doing ok’, which offers significant competitive opportunities across a number of products and services. Customers are content today, but as FinTech continues to raise expectations, customers may well become a little more demanding. Current account switchers have a 92% satisfaction rating with their banks, compared to an 80% overall rating for those who choose to stay put (Smart Money People data). So, if switchers are happier…why aren’t more people switching? Consumer awareness of the Current Account Switching Service (CASS) is estimated at between 41% to 69%, against a Treasury set target of 75%. But awareness of the CASS is far from the biggest issue. 2) Is it worth switching? In their 2015 report into CASS effectiveness, the FCA highlighted that there was a perception among many that it may not be worth switching. Our reviews have shown this to be the case. In the mind of consumers, the push (away from a perceived ‘bad’ provider) remains stronger than the pull (to a perceived ‘better’ provider), and there remains a high tolerance for ‘bad’ providers. Despite Barclays being one of the most complained about banks, they remain as popular as ever. With more competition on the way, the state of play looks set to change. Moreover some of this competition will look visibly different: different propositions, combined with different methods and approaches to engagement, mean that consumers will start to feel a stronger pull force as more tailored-propositions will make better easier to perceive. Being better will also offer organisations renewed hope around loyalty and ultimately, of attracting more of the customer wallet. Does loyalty work in financial services? To date, loyalty has been difficult to achieve in financial services. Indeed the view that consumers don’t really want to engage with their financial providers and simply buy based on rate and convenience remains widely held. Looking at some recent pet insurance reviews, we’ve seen that loyal customers feel far from rewarded. For this product, we split the population into two. Group 1 consisted of reviewers who have been with their pet insurance provider for 12 months or less, and Group 2 of those who have been with their pet insurance provider for over 12 months. When asked about value for money, group 1 offer a rating of 4.45/5, while group 2 offered a rating of 3.57/5. Due in large part to difficulties around preexisting conditions, group 2 feel bound to their insurance provider, which impacts their perception of being fairly treated and their view of loyalty in financial services. The consumer insight summary table demonstrates that on aggregate, consumers are happy with their financial providers, and increasingly happier with FinTech providers. While this is cause for optimism, the consumer satisfaction bar in financial services is currently fairly low. It looks set to rise as more differentiated propositions emerge. Knowing that you can switch current accounts has not provoked a mass exodus from incumbents. Put simply, the pull/push forces at play aren’t yet sufficiently strong enough. And finally, when it comes to loyalty, we’ve seen that a few financial brands are making solid inroads, particularly around authenticity. But there’s still much work to be done. You can also subscribe to receive our monthly insight by completing the below form.